As we get closer to the end of the year, I've been thinking about my 2006 personal highlights. In my "Top Five" would certainly be the FINA World Masters Swimming Championships this past August. This meet is held every two years and moves around the world (recently it's been in Italy, Morocco, and Montreal). 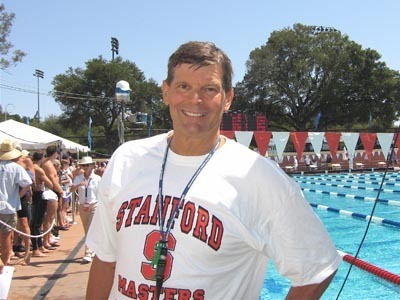 This year it was held in my home pool at the Avery Aquatic Center at Stanford, California. Over 7,000 swimmers, divers, and water polo players from over 80 countries came. 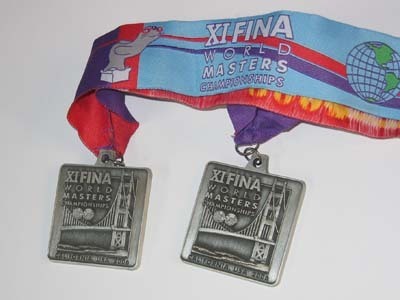 It was the fastest World Championships in history: over 150 former Olympians participated including Americans Gary Hall, Rowdy Gaines, Jim Montgomery, and Dara Torres. I think everyone felt like a "12 & under" again. The meet ran for a week, and was a very festive time. My main race was the 800 free (long course meters). I swam it in 10:48 and finished 17th in the world in my age group (55-59). (I guess a fair comparison to running is that it's like running 2 miles in 10:48.) I was really happy with my swim because the 800 is an "energy management" race. Since I'm more of a 200-400 swimmer, I have a tendency to go out a bit too fast and then have less left for the end. I've been swimming all my life, and I'd have to say that this meet ranked in my all-time top seven or eight swimming experiences. I'm even thinking about going to the World Championships in Perth in 2008 (when I "age up" to 60)! Maybe I'll see you in Perth, but good luck between now and then regardless. And thanks for a great blog, and fantastic products! Congratulations Roger! Now I get a sharper image of what you do when you say you "go out for a swim and come back". I'm impressed, really!